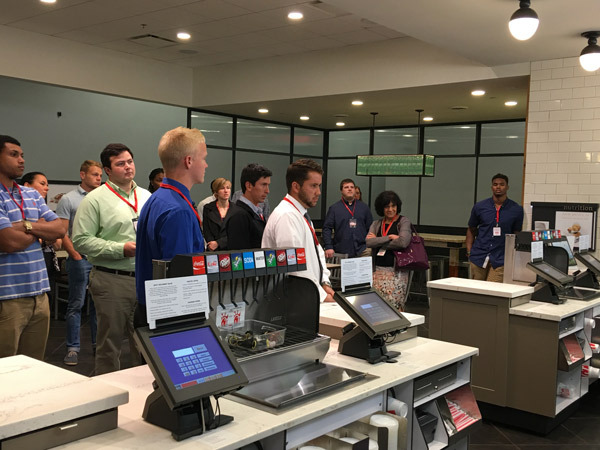 McCamish School of Business students took their learning off campus Monday, March 28 to Chick-fil-A headquarters in Atlanta. They were able to tour the facility and meet with Chick-fil-A CEO Dan Cathy. More than 30 students from the McCamish School of Business took their learning off campus March 28 to Chick-fil-A headquarters in downtown Atlanta thanks to Canton Chick-fil-A owner/operator Kevin Williams. According to business instructor Tina Boosell, Williams supported the trip with his money and time. Williams paid for the tour and accompanied the students on the trip, while Chick-fil-A provided lunch. Williams said he was happy to sponsor the trip and enjoys showing business students what kind of opportunities are available. Students met with Chick-fil-A CEO Dan Cathy who spoke about the company and his father’s passion for the business. “We toured Truett’s Office, talked with guides about the culture and history, toured the innovation center and visited the museum. Students also got to see collaborative work environments that they will experience as they begin work,” said Professor Tina Boosell. Students on the trip met with Andre Kennebrew, a talent manager at Chick-fil-A. He held a mock interview with student Carlos Guzman and offered tips on how to prepare for the job search and interview process. Student Allie Hale said she enjoyed getting to see the ins and outs of a successful business and was thankful for Kevin Williams and Dan Cathy for taking time out of their days for the RU students. In addition to the students, Dr. Roger Lee, vice president for student affairs and dean of students, Dr. Dana Hall, assistant professor of business, Cindy Moss, lecturer of business, Tina Boosell, instructor of business, and Dr. Kathy Hyatt, associate professor of business, attended the trip.